Donald I. Cadle, Jr., DMD understands the importance of a stunning smile. He knows that tiny blemishes in your teeth can affect your overall appearance and your self-esteem. Dr. Cadle can use porcelain veneers at his New Port Richey, FL practice to conceal minor cosmetic imperfections and create a beautiful smile. During a detail-oriented consultation, he will ask about your cosmetic goals. Then he will determine whether veneers are the most appropriate treatment for you. Dr. Cadle always makes honest evaluations, and he will never recommend more treatments than you actually need. Contact us today to learn whether veneers are the most effective way to enhance your smile. Whatever their use, your veneers will have a lifelike color and sparkle to blend beautifully with your smile. Before recommending veneers, Dr. Cadle will examine your teeth and discuss your cosmetic concerns. In addition to explaining what you can expect from porcelain veneers, he will also outline your other treatment options and their results. Then he will help you select the treatment most suited to your goals. For example, if you have overall bite misalignment, he may recommend Invisalign®, rather than veneers. Once you have determined that veneers are right for you, Dr. Cadle will begin to design your new smile. Along with esthetics, he will consider your dental arch form to ensure that your veneers do not upset the balance of your bite. Dr. Cadle takes a conservative approach to cosmetic care. He is happy to place one veneer over a single compromised tooth. In contrast, many other dentists will not place veneers unless you receive more than one. After planning for your veneers, Dr. Cadle will prep your teeth at a separate appointment. 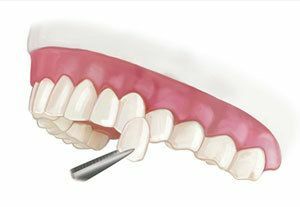 He will gently trim off a small layer of enamel so that your veneers will lie flat against your teeth. Then he will take impressions of your teeth, delivering them to our partner laboratory. For 35 years, we have worked with the same institution. With our long relationship, we trust the durability and beauty of their work. The skilled technicians will craft veneers that are a near-perfect match to the shape and color of your teeth. It will take between ten days and a month to complete your veneers. During this time, Dr. Cadle can provide temporary restorations to prevent sensitivity. When the permanent veneers are finished, you will have your final appointment. Dr. Cadle will lightly etch your teeth and attach the porcelain with tooth-colored composite. Veneers are highly durable, and, with proper care, they could last ten years or more. To maintain your beautiful new smile, you simply need to practice good dental hygiene. Brush and floss daily, and be sure to schedule your regular cleanings. Contact Cadle Cosmetic Dentistry to learn more about veneers and find out how they can improve your smile.